In an ideal world, I prefer to write 2-3 reviews for this blog per month. However, for the foreseeable future, I’ll probably be limiting my posting speed to one book per month.The reasons for this are threefold: first, summer break is fast upon us, it’s difficult to concentrate when kids are constantly underfoot and I am, after all, “Mommy.” Second, although this is a blog about pastiche, I have recently found myself fascinated by several Sherlock Holmes-related nonfiction topics which I think you will also enjoy–but for which the books are quite a bit denser and therefore take longer to review adequately. Today’s book is an example of this. Finally, I am working on a large project which will end up taking a fair amount of time and effort…but which will (hopefully) pay off in more (and better) reviews later on. So, basically, I’m still here, still reviewing, nothing bad has happened, and I hope you like the next few books! Honestly, woman! Stop blathering and get on with it. 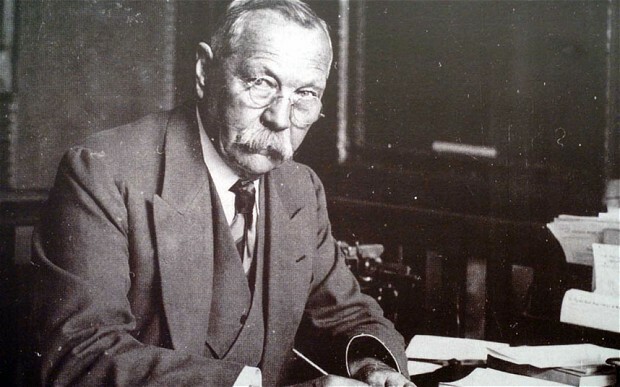 There are quite a few fairly current biographies of Conan Doyle to choose from, as well as some older works and his own autobiography, Memories and Adventures, first published in 1923. Some were written by people well-known in the Sherlockian/Holmesian world. Mr. Lycett, however, is not one of these. He began his career as a foreign correspondent for The Times, covering events in Africa, the Middle East, and Asia. His other books include biographies of the late Libyan leader Muammar Gaddafi (written with fellow reporter, the late David Blundy); Ian Fleming, Rudyard Kipling, and Dylan Thomas (as well as one on Wilkie Collins, out this fall). It was as Lycett was researching the Kipling book that he first became interested in Doyle, and through his Fleming bio that he was able to establish his credibility with Jon Lellenberg, BSI and thereby secure an introduction to Sir Arthur’s heirs. What happened next he describes in a detailed “Afterword,” and it will not surprise anyone with even the slightest knowledge of the continual controversy surrounding the Conan Doyle estate. In Through the Magic Door, Sir Arthur wrote that an “ideal biographer should be a perfectly impartial man, with a sympathetic mind, but a stern determination to tell the absolute truth.” Lycett quotes this (and more) in an epigraph. While it is probably impossible to know if he’s told the “absolute truth,” Lycett seems to have done his best to be impartial. The Arthur Ignatius Conan Doyle who emerges from these pages is nothing if not a full human being, with all of the contradictions that implies. Let’s examine a few of those, shall we? The Great War made this need all the more urgent. While the British (and other European nations) had been losing soldiers to various hostilities (the Crimea, the two Boer Wars, etc.) for over a century, the scale of this conflict and the brutality of the new warfare was unprecedented. It’s possible that no household was left unscathed, either by the war itself or by Spanish Flu, which ravaged the globe directly on its heels. 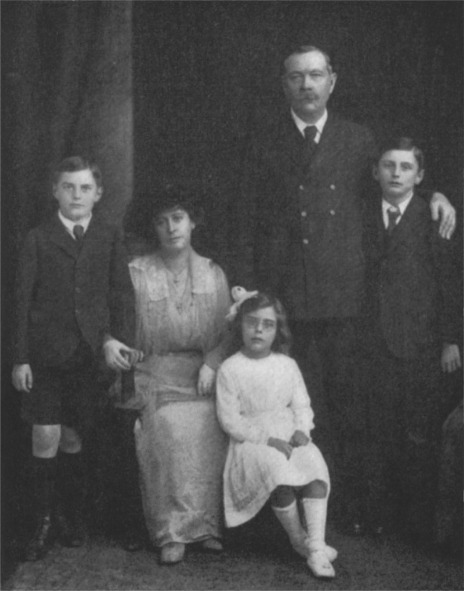 The Conan Doyle family lost friends, nephews, Jean’s brother Malcolm, Arthur’s beloved younger brother Innes, and his oldest son, Kingsley (the latter two both succumbing to influenza). It’s not unusual for personal loss to push normally earthbound people into at least one attempt to contact their loved ones; around this time, spiritualism attracted many new believers while some who had hovered on the skeptical fringes, such as Conan Doyle, decided to openly convert. Even in his days as a researcher (and member of the SPR), however, Arthur was never, as Lycett shows us, the rigourous debunker he may have imagined himself to be; his need to prove was consistently stronger than his need to be sure. It is no wonder, in the end, that he espoused spiritualism zealously. What’s actually fascinating is that he shared so few personal traits with the character he brought to life. Sir Arthur also was a man of intense contradiction when it came to his family and friends. He was, by all accounts, a very good friend–loyal and quite generous with both his time and money. Even his friendship with magician and psychic debunker, Harry Houdini, which famously came to an acrimonious end, did so due to Doyle’s innocent belief that Houdini was unaware of his own supernatural powers, and that Lady Jean Doyle had actually contacted the magician’s mother during an automatic writing session. The magician’s public rejection of this last left Doyle both confused and hurt, and Lycett covers their protracted argument thoroughly. As a family man, Arthur was also loyal and generous…in his way. As the eldest son in a family in which the father was crippled by alcoholism, he eventually took on the role of provider; for most of his adult life, he subsidized his mother and sisters, including one who had married a poor clergyman. Although finances typically complicate family matters, by and large he seems to have taken this responsibility in stride. Always a social man, he enjoyed visiting family, and frequently had them as long-term guests in his home. His correspondence with his mother, full of his confidences and her advice, is both voluminous and legendary. The extended Doyle family. 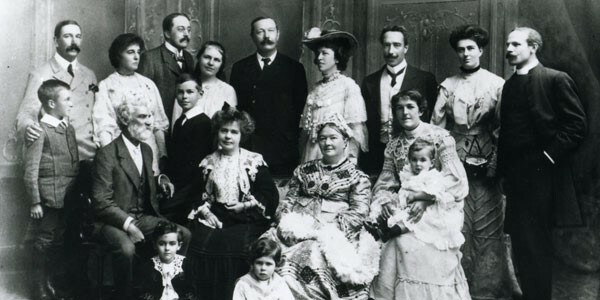 ACD is in the back, Louise is seated to his right, next to “Mam.” Kingsley and Mary are standing between their parents. When it came to his immediate family, however, it seems that he stumbled. Conan Doyle’s relationship with Jean Leckie, conducted while his first wife, Louise, was ill with the tuberculosis which eventually killed her, is common knowledge, and Lycett covers it with the fairness and detail one would expect. There are no shocking revelations here. What I found most interesting were the brief accounts of Arthur’s first marriage, and a better understanding of his second, with Jean. There seems no doubt that he loved both women–in his own fashion. For Louise, of course, there were lengthy trips to salubrious climates after her 1893 diagnosis, as well as Undershaw–the home he built with her health in mind. Yet for the most part in their marriage (what little we can know of it, as Jean seems to have rid the family papers of most references to her predecessor), it seems that Louise remained perpetually in her husband’s shadow and dependent on his inclinations. Lycett recounts one telling example: When, in anticipation of the winter weather and its effects on her health, Louise wanted to go back to spend the season in Egypt, Arthur denied her request on the grounds (as he told his brother Innes) that he found it impossible to write there.†† Even Jean, who seems to have played “Rachel” to Louise’s “Leah,” found that, once she finally became Lady Doyle, she was often relegated to the background. Readers who wonder why Jean took up automatic writing and channeled a “spirit guide” when she had always disapproved of her husband’s spiritualist activities will wonder no longer when they realize that these easy-to-feign abilities gained Arthur’s attention, praise, and also convinced him to finance a cottage and home improvements.††† Doyle’s failures as a father are also well-known, and receive what seems to be objective treatment here, although Lycett fails to make the obvious point that, given his own boyhood, Arthur may not have really known how to be present for his children. What I came away with, in the end, was a picture of a family in which, while it is clear that he loved them, Sir Arthur’s own goals, desires, and needs of the moment were nearly always paramount. Arthur and Jean with Denis, Adrian, and Lena Jean. This photo was used as a frontispiece for “Pheneas Speaks,” supposedly containing words of wisdom from Jean’s spirit guide. Many of those goals, needs, and desires centered on writing. Given Conan Doyle’s publishing savvy, his prolificity, and his ability to create profitable work on demand, I must confess that I had a view of him as a writer who just churned out stuff to make a living. This was unfair. Arthur may have said that the title he valued most was that of “Doctor,” but medicine wasn’t ever his vocation. The man needed to write, it was the core of his being, and Lycett does his best to keep up with him. For the casual reader, just looking for a nice overview of the author of The Lost World or those popular detective stories, he’s adequate. For Sherlock Holmes fans, however, Lycett falls short. This was particularly evident to me in his treatment of the creation of The Hound of the Baskervilles, the William Gillette play “Sherlock Holmes,” and the lead-up to the publication of “The Empty House.”‡ What you will find fascinating, however, is the way Conan Doyle’s life bleeds into his writing. If you write yourself, you’ll know this happens, but it’s fun to see Lycett pop up example after example. Many involve names, but others are fairly obvious attempts to resolve, however subconsciously, the concerns Arthur is facing at the time. In the case of his father, this is touching; in the case of his relationships with Louise and Jean, maybe not so much. Readers may also find that Lycett occasionally stretches too far to find psychological meaning where Doyle may have just been trying to write a good story. Sometimes a leather funnel is just a leather funnel. Over the years, I’ve become convinced that, when it comes to biography, your first choice matters. Without any other source to measure them against, those first facts become cemented in your mind; you imprint on them like a duckling, and what you take in from that first reading can be difficult to dislodge. If you’re looking for a thorough, painstakingly researched overview of Sir Arthur Conan Doyle’s life, I can definitely recommend Lycett’s book. For all that I stumbled over the cricket descriptions (when it comes to Doyle, cricket is inevitable), and the unfamiliar British politics, I came away with a sense of the man as–not a Watson, not a plaster saint, and not always as he saw himself–but as a complicated human being who can’t be summed up in a few sentences, 2100 words, or twenty-one chapters. This is, paradoxically, what good biography does. In bringing his subject back to life, as it were, Lycett avoids falling into the trap of making Doyle’s life completely comprehensible, centered around clear themes, the way we might wish life would be. Instead, he shows a man who doesn’t always know what he is doing, who doesn’t know what it all means (even when he thinks he does), and who is just trying to do the best he can–even when he gets it wrong. It’s a disquieting portrait occasionally, but also comforting, because we’re all in the same kind of boat, aren’t we? And if one of us was bold enough to throw away a certain future of ascultation and prescriptions to take his boat on a crazy chase up the Thames, well, we’re all the richer for it. The Man Who Created Sherlock Holmes is available in both print and ebook form, and from online and bricks-and-mortar booksellers. You can find Andrew Lycett’s website here: http://www.andrewlycett.co.uk, and you can follow him on Twitter at @alycett1 . What do you look for in a biography? What intrigues you about Conan Doyle’s life? First commenter wins a paperback copy of today’s book! *Originally published in the UK by Weidenfeld & Nicolson, 2007. **Also known as Dr. John Watson’s literary agent, by those who play The Game. Information about the efforts to preserve Undershaw may be found here: http://www.saveundershaw.com/. I also got the term “womb to tomb” from Mr. Duncan, but he says he did not originate it. †Try as I might, I can’t escape the image of the Tower of Babel here, but that’s probably just me. †† Lycett, p. 263. If you read further, you realize that ACD’s real motive for refusing Louise was that he wanted to travel to South Africa to fulfill his ambition to participate in a military conflict–and to write about it. †††While Lycett’s book did nothing to change my firm position on Team Louise (and probably cemented it, frankly), I have to say that he softened my view of Jean Leckie, at least post-marriage. ‡For an in-depth play-by-play description of these, see Alistair Duncan’s An Entirely New Country. What I look for in a biography is difficult–an interesting subject, perhaps. It could be someone whose work (as actor, writer, etc.) has interested me or someone I’ve never heard of before but whose story seems significant. I think Doyle is intriguing because he wrote so many different types of stories, and he, like most of us, has contradictions. I read Lycett’s book two or three years ago and I don’t remember specifically if he states that Doyle and Leckey’s relationship became physical while Jean was alive or just implied it, but that was the controversy surrounding the book when it came out. Most biographers of a Sherlockian bend believe the physical aspect came after Louise’s death, if not after marriage. Sexual relations with Louise was not possible after the diagnosis of tuberculous and she lived for thirteen (?) years after that. Given that Doyle was raised with stories of chivalry and honor, he tried to live his life that way. While Doyle did fall in love with Jean while Louise was alive, Doyle was the type of man who would see it as a matter of honor to remain chaste and to fulfill his vow to Louise. He was an imperfect man; he had his faults, but Doyle’s epitaph “Steel True Blade Straight” had a very deep meaning to him, and one he would do his best to live up to. A very good Doyle biography, but not the only one to read. I also like “Teller of Tales” by Dan Stashower. By the way, BBC 4’s Great Lives broadcast on Doyle with Lycett and Gyles Brandreth pretty much trashes Doyle in this regard, assuming facts not in evidence. Yes–I didn’t want to cover it in the review, because I’m always in danger of rewriting the book in the summary, but Lycett does kind of go up to the edge of that cliff–but then steps away. He does this with the possibility that Mary Foley Doyle’s relationship with Bryan Waller was more than platonic, also. In the end, I agree with you that, while it may seem impossible to many denizens of the 21st century, ACD remained physically faithful to Louise throughout their marriage. It’s clear that he didn’t want to hurt anyone, although he was fooling himself to think that the whole fact of Jean’s existence in their lives wouldn’t be painful to Louise, even if it seems that she came to terms with it in the end (her conversation with Mary implies this–p.310). As you point out, Doyle was a decent, chivalrous man who cared about others, and who cared about doing the right thing. He would see it as his responsibility both to be a faithful husband, and to guard Jean’s virtue. And there are the practical considerations–the risk of pregnancy, for example. Something like that could ruin his career, reputation, and political prospects. His behavior through the whole thing indicates that he believed he was successfully walking that thin line. He’s open about his friendship with Jean, for example; he’s perfectly ok with responding to the census in that supposedly smoking-gun hotel stay, and for pity’s sake, he’s in that hotel with Jean and–his mother! Although the married woman in me bears him a bit of a grudge for becoming emotionally involved with Jean, the realist in me understands that this was a man who needed female companionship (not just physical) which Louise could not provide, and that he was in an extremely vulnerable position–particularly as Miss Leckie seems to have been a better match for him. As far as Jean goes, Lycett makes the slightly clueless statement that “There was no obvious reason for [her] to spend the best years of her life in expectation.” Aside from the fact that I am sure she loved Arthur, practically (even coldly) speaking, she was looking at an enviable match, and a sure thing. Why wouldn’t she wait? During their courtship, and particularly as she got older, it seems that she had more power in the relationship, and in my not-that-humble opinion, she probably could have regulated its tone to keep it from being as blatant as it seems to have become, but I’m sure that’s easy to say, and much harder to do.